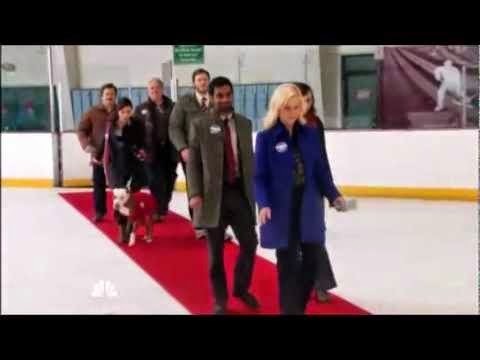 Parks and Recreation is, obviously, amazing, and the fact that it's ending isn't something I can talk about calmly. So instead of mourning the loss of my imaginary best friends, I'm going to pay homage to this cultural touchstone by using pieces of it to describe the highs and lows of reaching the nowhere land gray area of ABD (all but dissertation) status in a PhD program. See, for my particular program, I spent a long, long time taking coursework because I was a part-time student and a full-time employee. This meant I took only one class at a time and the prospect of completing oral and written doctoral exams, completing a dissertation, and graduating were so far in the distant future as to warrant no actual concern on my part. I just went along taking classes and reading books not realizing how close I was getting to actually being face to face with a set of exams that would literally take more time than anything else I had ever done. So there I was with a list of 100 books, only 20 of which I'd read before, that had to be finished before I could start the exams. That included reading some heavily philosophical texts that left me wondering about the meaning of life and the nature of reality. And then I read some things (cough, Kenneth Burke, cough) that left me wondering if I actually knew what words meant. But I also read a lot of things that were amazing and made everything click into place--if only for a moment. Once that task was complete, I started the written exam. I was given a question to answer in a 25-page paper that was due in exactly one week using as many of those aforementioned books as possible. Not only did I have to face this stressful mental task, I had to balance it with the responsibilities of being a wife, mother, and full-time college instructor. The sheer chaos of this was enough to make me question why I'd ever entered graduate school to begin with. But I buckled down and decided to throw myself into the task, using my husband's accrued hotel points from work travel to rent a room for the weekend and write ferociously. So I packed up about 40 of my 100 books into suitcases and locked myself into a room, full of energy and optimism but also the constant nagging reminder in the back of the mind that this meant I was abandoning all other responsibilities like grading papers. And washing dishes. And walking the dog. And parenting. And talking to other human beings. But then an even greater dread settled upon me as I realized that I actually had to write this thing. The best way to write is to just write, so I did that. It was a mess. And after about hour twelve, I started to panic and called home for support. Eventually, things started to fall into place, and I was fairly confident that it would actually be a draft of something coherent . . . maybe. I left the hotel room with a fairly solid draft, fixed it up between grading papers over the next few days, and turned it in a full day early, feeling really good about myself and life and whatnot. But then I had to sit and wait to hear if I passed or not. This is a stressful time. You have to find ways to cope. When word came that I passed, I was ecstatic . . . for about fifteen seconds because the same email also contained the plans to schedule my oral exam: a two-hour task in which I would be drilled on the paper I'd just written as well as any of the books I hadn't mentioned in it. But I took some deep breaths, and decided to just dive in and get it over with. I bugged my friends and family to reassure me it would be okay. But their kind words didn't stop the horrendous nightmares of me getting in front of the panel and being unable to form sentences. But that didn't happen! I formed words. I said things. I passed. I immediately thought of ways to celebrate. And I left that day feeling like a superhero, fully capable of conquering the world. But that exam isn't actually the end. In fact, it's really not even close. Even though I had spent hours and hours and hours preparing for it over several months, the buzz from passing was an incredibly brief one as I stared down the prospect of writing a book-length dissertation in the midst of full-time teaching, parenting a preschooler, and trying to keep at least a little sanity. And the stress of balancing all of these complex tasks has led me to make some questionable choices when it comes to health and well being. And since I have very few uninterrupted hours in the day that I can devote to brainstorming and writing, I have to send myself texts and emails whenever an idea strikes me. I'd be lying if I said I never thought about just giving up on this Sisyphian task. I may have once or twice (or six times) thrown a book across the table and declared that I will never read anything ever again. Because, really, getting comments back on a chapter draft that tells you to cut a fourth of the material can be a little demoralizing. And the stress can make you get a little testy with the innocent people around you who are only trying to interact with you like a normal human being. But, I'm going to keep pushing through because I know that my hero Leslie Knope would never let little things like sleep deprivation, humiliation, and despair stop her from her dreams, so neither will I.
I have been there and survived the awful, horrendous gauntlet of pain that is ABD status. In fact, my status didn't end until this past November. I somehow managed to land a job, move across the country, and start said job -- all while completing my dissertation. My advisor didn't want to see anything until I had the entire first draft completed (stressful), which meant that I didn't know if I was going to get to defend last fall (panic), which meant I might have had to pay for more hours at an out-of-state rate (terror) and not receive a needed paycheck boost that would come with my getting the PhD (gulp). My comprehensive exam experience was a different sort of hell. I was one of the last under the "old" method - get a reading list, memorize everything (including citations) for two areas, sit in a room for eight hours with a list of questions you have to answer using all of the information you've memorized... then do it again two days later for the other substantive area. I think I lost the ability to smell rain and many of my childhood memories -- all forced out to accommodate information about the gender wage gap and other such facts. The only thing I can say is that it is survivable. I don't know how I did it, to be honest, other than pure stubbornness and a large stash of Diet Coke. 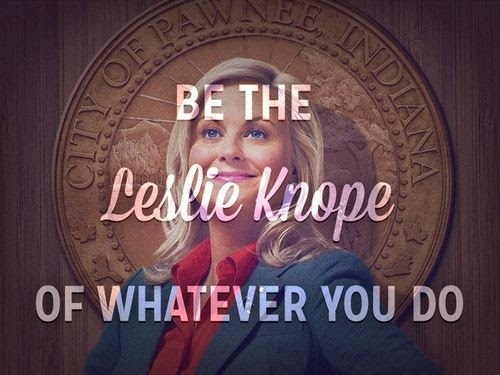 Leslie Knope kept me going, as well. And, like Leslie, you no doubt have a supportive team in the form of your committee members. Your committee members want you to succeed. Don't forget self-care ("lolly-poppin'" is not really a thing all the cool kids are doing). Treat yo' self every once in a while. And know that, unless Zorp has plans to end everything tomorrow, you'll knock it out. That "old" method sounds both horrifying and not particularly useful is producing much you can use later. Glad you made it through to the other side! I hope to join you by year's end! Wow, this is amazing. Academic nerdiness + Parks and Rec + Parks and Rec GIFS! As someone who has come out on the other side, I think you're spot on with that last point. I saw many peers get mired in angsty spirals because what they were writing wasn't absolutely perfect the first time. Don't get me wrong; I might have cried, ranted, and/or cursed my diss director a few times, but what got me out was to just. Keep. Writing. Sending good fuzzies your way! Thank you! I'm currently accepting all the good fuzzes I can get!